[Limited Edition] To be honest, I had gone to Target hoping to find the new mini donut flavor with the backup plan of picking up their cotton candy flavor for a crazy sundae idea I have. I struck out on both counts, so I decided to grab this limited time only flavor instead. 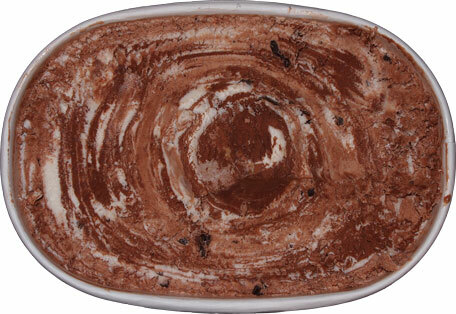 Hehehehehe, I've removed the very top layer to reveal one cool looking ice cream. You have to love the stark color contrast between the two flavors. I spy chips here and there, but where's the graham? 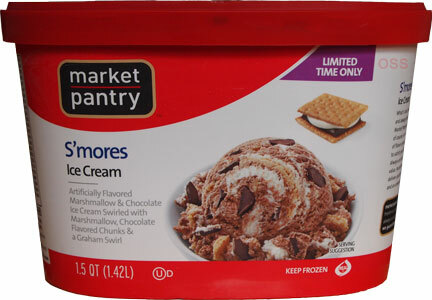 The problem on these first few small servings is that I can't find the graham swirl. I've found two very small chunks of graham, but that's it. The chocolate and marshmallow sides are interlocked to deliver a pretty fun chocolate marshmallow flavor, and the chips are adding a light thudding of darkness here and there, but the graham has been a no show and that's a shame. On Second Scoop: So as I'm digging down to find the non-existent graham swirl, I stumble upon a section where the ice cream swirls aren't mixed. I try the marshmallow and it's neat, nothing crazy, but you get the marshmallow vibe. And then I go for the chocolate... oh my the chocolate! Wow, I didn't notice it when it mixed with the chocolate, but wow is it dry. Like it's been a few minutes and I can still taste the dark dryness of it. 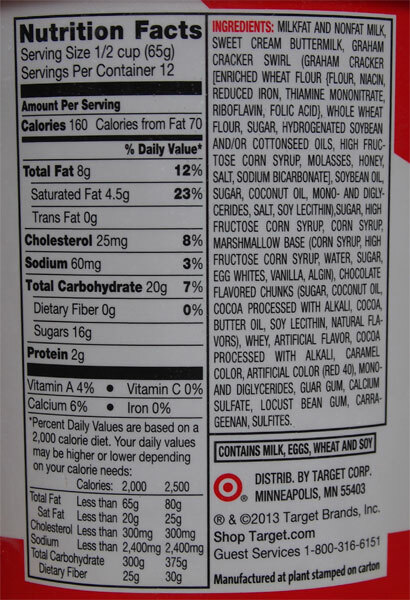 I never would have expected that from a Target flavor! That said, there is no way I could eat more than a few bites of this chocolate by itself. It's not an intoxicating dark chocolate, it's just a brutal dark chocolate. Oh it's unique but oh so bold..... ok, I probably got my point across. The two ice creams are just fine together, and there is some fun if you hit enough chips, but there is still no graham..... this could have been so much fun with more graham. On Third Scoop: I did it! I found the swirl! I was having a little late evening snack in the darkened kitchen when I thought I tasted graham. I went bent for another bite and hit something! I flipped on the light and sure enough I found the swirl (top right corner arrow). It's a fine swirl, but there is so little of it. 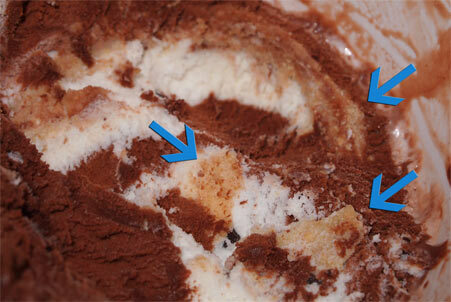 The other two arrows are pointing at paper thin swirls of graham, very hard to detect over such a bold chocolate. Hopefully some of you can try this one and report back, otherwise I'm buying another container myself. Verdict? bold profile, but where's the graham?! I had this before and I really liked it. For me it was hard to spot the graham swirl but every bowl I ate had a strong graham taste. I thought the swirl was a little gritty but the flavor was really great. I thought all of the flavors went well together.